"More than 500,000 men get vasectomies every year," Chen said. "There's a huge market for this research, and now we further understand the genetic underpinnings of sperm development in mammals." 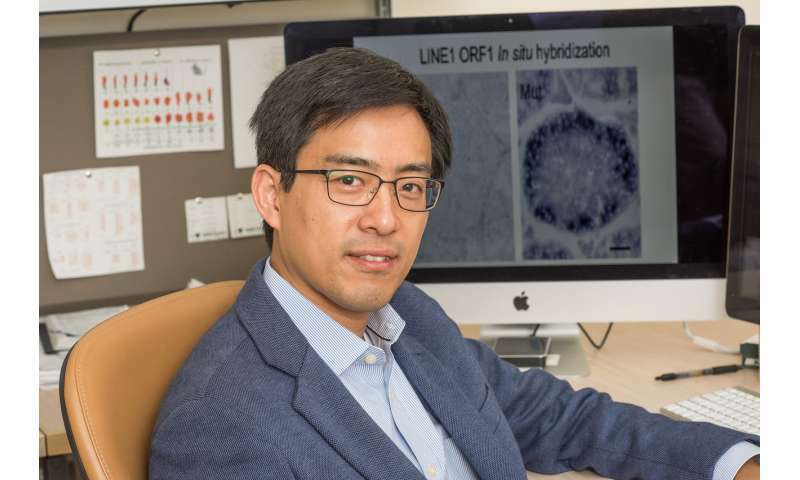 At the genetic level, Chen identified PNLDC1, a genetic trimmer, as the key in this process. PNLDC1 trims small silencing RNAs that silence transposons, which can be described as genomic parasites. They're also called "jumping genes" and can hop into good genes and disrupt them by causing human diseases. To see if the genetic changes produced the desired results, Chen's team employed CRISPR/Cas9 technology to produce a genetically modified line of mice lacking the PNLDC1 gene. Bred without PNLDC1, the mice had fewer sperm and smaller testicles, leaving them infertile. The researchers also observed that PNLDC1 wasn't overly involved in other biological activities. There were few, if any side effects, and the mice had no obvious differences in growth, behavior or appearance, other than having small testicles. The defect from PNLDC1 deficiency also is male specific. This genetic immune system is required for male germ cell development, but it isn't part of female germ cell development in mammals. "This small RNA-based immune system is quite smart. It can detect what sites are producing parasite-infested RNAs, and go there and shut them down," he said. "So silencing transposons is like fixing a water leak in your house. Rather than stuff a rag into the leak and hope that it works, we went to the source and turned off the water supply."